What Goes Into an Airsep? 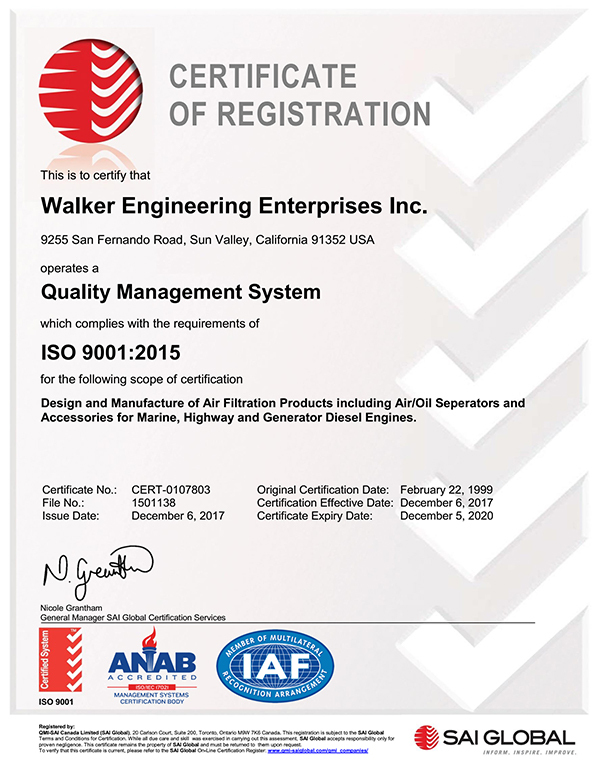 Since February 1999 Walker Engineering has been registered/certified to ISO9001 standards. Many customers and dealers ask what exactly A registration means, and what benefit it gives them. Basically, a registration is very hard to achieve and even harder to maintain. Well, several years ago, as the U.S. economy expanded, many companies sought to produce products and sell to various automotive manufacturers. We mention automotive manufactures, since they were the primary target for the quality system. Since many plants were several miles from suppliers, there needed to be a way to evaluate, grade and select the quality traits of a product, wherever it came from. Current primary quality traits include product design, product process (how the product or key parts are made), documentation (consistent drawings for repeatability and a "paper trail" for tracking a particular part), delivery, and, finally, plant logistics. All of these issues, as well as others, need to be addressed and pledged in a universal company manual. It is a lot more difficult and meticulous than it appears. Registration comes only after a third party audit, which may last two to four days. During these audits, we show a specific design and build procedure, as well as our ability to check on a part if a future problem were to develop. Walker Engineering is audited no less than once a year to maintain registration. There are many large companies that have not achieved registration. So, we are proud to be at the same level as companies such as Ford, GM, Chrysler, Caterpillar, and other respected businesses. What that means to our customers is that our products are built better than ever. They are more consistent, more closely scrutinized during production, and maintained by a company quality policy of continuous improvement. Perhaps you may have noticed all AIRSEP units now include a spare filter part number label on the unit. That was just one aspect of our continuous effort of improvement. Greater consistency means entry into expanded markets of automotive, International, and global markets. That equates to a better product at a reasonable price. Just received Walker products or recently had some Walker equipment installed on your engine, vessel, or jobsite? Please take a moment to fill out and submit our short customer satisfaction survey.